The official trailer for Disenchantment kicked off the panel for the highly anticipated new series from Matt Groening at San Diego Comic Con 2018 on Saturday, July 21st at 5:30 PM PT. The trailer features a medieval inspired re-recording of David Bowie’s hit song “Rebel Rebel.” Allie Goertz (MAD Magazine/”Everything’s Coming Up Simpson” podcast) moderated the panel discussion that followed with creator Matt Groening, showrunner Josh Weinstein, and cast Eric Andre, Nat Faxon, John DiMaggio, Billy West, Maurice LaMarche, Tress MacNeille, and David Herman along with Claudia Katz from Rough Draft animation studio. 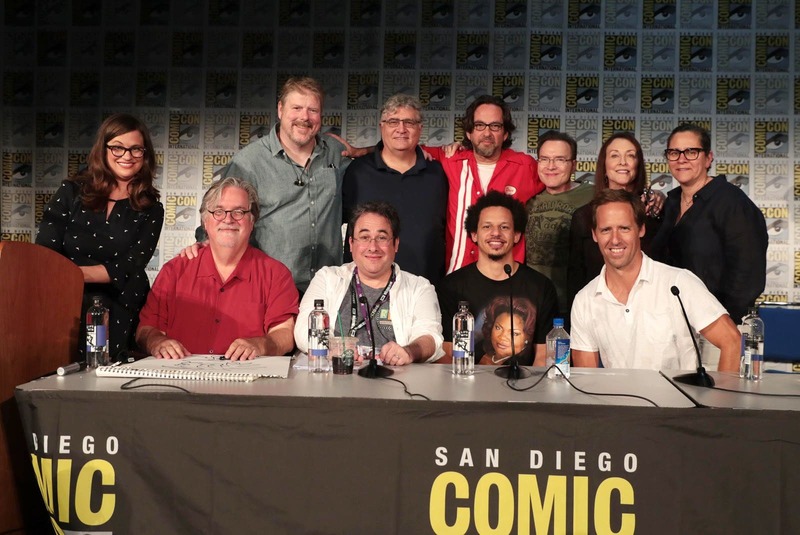 Allie Goertz (MAD Magazine/”Everything’s Coming Up Simpson” podcast) moderated the panel discussion with creator Matt Groening, showrunner Josh Weinstein and cast Eric Andre, Nat Faxon, John DiMaggio, Billy West, Maurice LaMarche, Tress MacNeille, and David Herman along with Claudia Katz from Rough Draft animation studio.